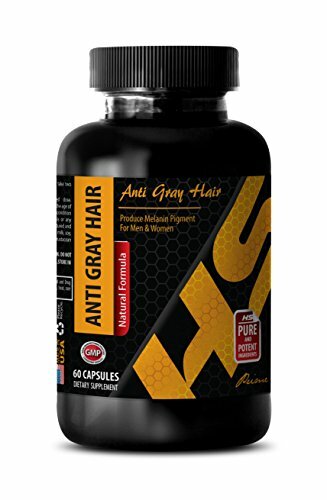 ANTI GRAY HAIR: Is perfect for people who wish to support their hair to look better and younger with more youthful qualities using natural occurring ingredients. In this natural supplement we use thefollowing ingredients: Vitamin B6, Folic Acid, Biotin, Pantothenic Acid, Zinc, Catalse, Horsetail, Saw Palmetto, PABA, L-Tyrosine, Plant Sterols, Nettle Root Extract, Chlorophyll, Fo Ti Powder, Barley Grass Juice. HEALTHY SKIN SUPPORT: For many people, a Vitamin H deficiency can lead to conditions with their skin's inner health and outer appearance. Dry, itchy skin is one of the most common conditions. In most cases, a biotin supplement may support the skin, improving it and helping to create a youthful glow. To address biotin deficiencies, it's important to access the vitamin in the most effective way. Ingesting a biotin supplement to receive all of the vitamin's benefits is the most efficient way of absorbing it. CARDIOVASCULAR FUNCTION SUPPORT: Folic acid is a significant tool in improving the function of the human heart. It does so by removing homocysteine, which is one of the major causes of heart conditions at early ages. It controls the level of deposition of cholesterol in the human heart, thus ensuring that our cardiovascular system is supported from various conditions. Vitamin B9 is an essential element in the formation of red blood cells. BOOST YOUR MOOD: Vitamin B6 may raise levels of serotonin. Research has shown that vitamin B6 has a supportive impact on the central production of both serotonin and GABA neurotransmitters. These are important compounds that control mood and are needed to support good mood, control pain, fatigue and anxiety. Vitamin B6 has been associated with increasing mood. BRAIN FUNCTION SUPPORT: B vitamins in general are often correlated with improving mental function because they can support against many conditions such as poor brain functions or age-related cognitive and function loss. Obtaining proper amounts of B vitamins including vitamin B5 may be able to help support memory retention. Vitamin B5 is known to regulate our compounds, therefore it may have the ability to reduce stress, anxiety, and depression. YOUTHFUL HAIR: Vitamin Vitamin B7 is needed to maintain healthy skin, hair and nails, so when someone experiences a vitamin B7 deficiency, symptoms may manifest in the form of thinning, splitting and brittle hair, or dry and irritated skin. You may notice that biotin is included in many cosmetic face creams, hair masques and other over-the-counter beauty products for this reason, but it's much more effective when it's eaten, rather than applied topically. IMMUNE FUNCTION SUPPORT: Vitamin B5 is very good at strengthening the immune system. This helps us fight against a number of conditions. To make sure your system is well defended from invasion, be sure that your white blood cell count is maximized and your immune system is functioning properly by eating foods that are rich in this vitamin. ENERGY METABOLISM SUPPORT: All B vitamins help your system to convert carbohydrates into glucose, which is used as fuel and produces energy. It does this by synthesizing a factor known as coenzyme-A (CoA), which breaks down sugars in the form of glucose for energy. B vitamins also help to synthesize and metabolize fats and proteins. Vitamin B5, along with other B vitamins, can help our systems use the foods we eat in order to build our tissues and muscles. OUR GUARANTEE: MANUFACTURED IN THE USA! In state-of-the-art facilities & strict adherence to good manufacturing practices (GMP)! If you have any questions about this product by HS PRIME, contact us by completing and submitting the form below. If you are looking for a specif part number, please include it with your message.